6 months of Crossfit Unlimited at The Power Station Hood River months of Crossfit Unlimited at The Power Station Hood River. CrossFit group classes are offered Monday through Friday in the morning, noon, and evening, and Saturday mornings. Our CrossFit classes will include a skill-based warm-up, skill work or strength training, the Workout of the Day (or “WOD”),and mobility work. The workouts can always be scaled so that new athletes can work out alongside veteran athletes. classes are offered Monday through Friday in the morning, noon, and evening, and Saturday mornings. Completion of either a CrossFit 101 course or Private Coaching Intro to Crossfit is a pre-requisite for joining our CrossFit classes. • Is looking to get in shape but can’t face going to a gym, Has lost interest in your gym routine, Thinks you don’t have time to exercise, Is looking to get faster or stronger in your sport, Is no longer seeing results with your current training regime, OR Just plain wants to look good in a bathing suit! Then CrossFit is for YOU! CrossFit group classes are offered Monday through Friday in the morning, noon, and evening, and Saturday mornings. Completion of either a CrossFit 101 course or Private Coaching Intro to Crossfit is a pre-requisite for joining our CrossFit classes. 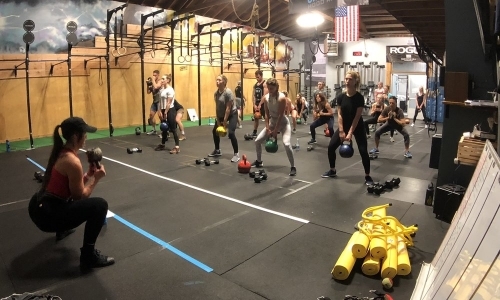 Our CrossFit classes will include a skill-based warm-up, skill work or strength training, the Workout of the Day (or “WOD”),and mobility work. The workouts can always be scaled so that new athletes can work out alongside veteran athletes. Members pay a monthly membership fee and may attend any CrossFit classes that fit within their schedule. See our Group Class Schedule for specific class times. Present your certificate at the business to redeem your item.